On 2017 August 21, a total eclipse of the Sun is visible from within a narrow corridor that traverses the United States of America. The path of the Moon's umbral shadow begins in northern Pacific and crosses the USA from west to east through parts of the following states: Oregon, Idaho, Montana, Wyoming, Nebraska, Kansas, Iowa, Missouri, Illinois, Kentucky, Tennessee, North Carolina, Georgia, and South Carolina (note: only a tiny corner of Montana and Iowa are in the eclipse path). The Moon's penumbral shadow produces a partial eclipse visible from a much larger region covering most of North America. The following map shows the overall regions of visibility of the partial eclipse as well as the path of the Total eclipse through the USA. It uses coastline data from the World Data Base II (WDB). 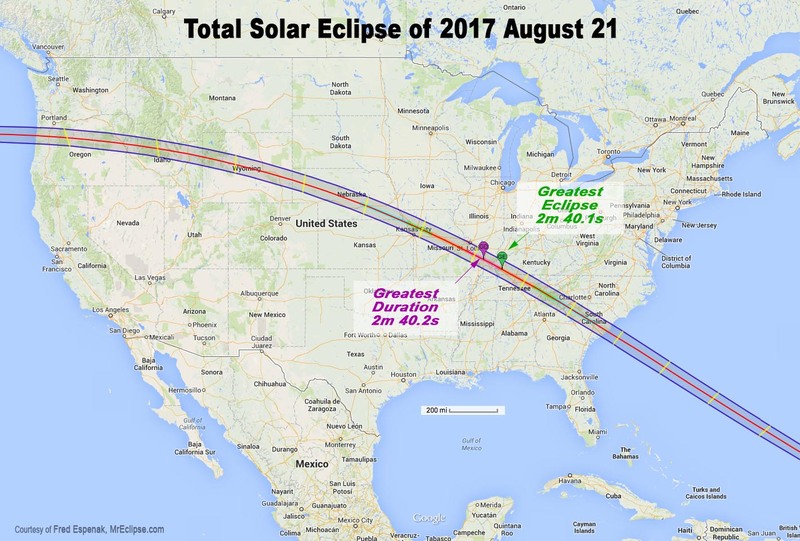 An implementation of Google Map has been created which includes the central path of the 2017 total solar eclipse. This allows the user to select any portion of the path and to zoom in using either map data or Earth satellite data. Other interactive eclipse maps include those by Xavier Jubier and Bill Kramer.